Arabs have been immigrating to the U.S. since the 1870s, and while many have integrated successfully into American society, experts say that the Arab-American population as a whole has not reached parity with other white ethnic groups who share similar immigrant histories. Jennifer Holsinger, associate professor of sociology at Whitworth University, explores some of the reasons behind this trend in her new book, Residential Patterns of Arab Americans: Race, Ethnicity, and Spatial Assimilation (LFB Scholarly Publishing LLC, 2009). "Since the 1960s, the number of immigrants from just about every place in the world has increased drastically, and Arab Americans are one of the fastest-growing populations," Holsinger says. "Yet Arab Americans remain ignored by researchers and often misunderstood by the rest of society." Using statistical analysis, Holsinger studied the spatial patterns of Arab-American communities in Chicago, Detroit, Los Angeles and New York and found that Arab Americans did indeed have lower degrees of assimilation than their fellow immigrants from other countries. She attributes that difference mainly to recent immigration, but also to media portrayals of Arabs and Muslims, and to socio-political trends in the U.S. and the Middle East. Although the effects of the terrorist attacks on Sept. 11, 2001, on the Arab-American population have been profound, Holsinger claims that negative perceptions of the population among Americans already existed, citing hate crimes reported in the 1990s from the Chicago Commission on Human Relations and the Los Angeles Commission on Human Relations. "I hope that my book will remind readers about the rich ethnic and racial mosaic that makes up our country," says Holsinger. "More specifically, I hope that they become more aware of who Arab Americans are – and who they are not. The Arab-American population is very diverse, which serves as a reminder that is it difficult to make generalizations and jump to conclusions about specific members." Over the past century, Arab immigration to the U.S. has come in two significant waves, shaped by political and economic forces in both the sending and receiving countries, according to Holsinger's book. Nearly 25,000 Arabs immigrated to the U.S. in 1914 due to several factors, including the faltering administration of Syria's Ottoman Empire, religious tensions between minorities, and a chain of social relationships between the countries. This wave diminished in 1924, when, under the Johnson-Reed Act, the U.S. by law permitted only 100 Syrians to immigrate to the U.S. each year. The second wave of immigrants began after the Six-Day War, in 1967, and has increased steadily ever since, Holsinger says. The Six-Day War was waged between Israel and its neighboring Arab states, and it resulted in Israel gaining control of several key regions, including the Sinai Peninsula, the Gaza Strip, the West Bank, East Jerusalem and the Golan Heights. By 2007, more than 1.5 million Americans claimed Arabic descent, according the U.S. Census Bureau. Although Holsinger lived in the Middle East as a child, she didn't become interested in studying the Arab world until she did some of her undergraduate studies in Cairo, Egypt. During that time, she worked with adolescent girls through a social service agency in the Moqattem neighborhood, also called "Garbage City." Holsinger says she learned through that experience about the issues surrounding poverty and oppression and the value of cross-cultural dialogue. She then researched the spatial assimilation of Arab Americans for her doctoral dissertation in 2001, which ultimately led her to write Residential Patterns of Arab Americans. Holsinger says immigrants often move into a new country at great psychological and financial cost. A country's residents may welcome newcomers with open arms, but they also might receive them with trepidation and misconceptions. Thus, the environment that immigrants enter makes a significant difference in their adaptation process, she says. "Some Arab Americans achieve high socioeconomic status, while other Arab Americans are struggling with low levels of education and high rates of poverty," Holsinger says. "In the end, many of us don't differentiate between Iraqi Americans and Palestinian Americans, for example, so all Arab Americans must figure out how to navigate these perceptions and the resulting social structures." She continues, "My experiences in the Middle East and with people of Arab descent have shown me that fear [of these groups] is usually not justified and, in fact, it can be very harmful to our society's well-being as well as to our own individual well-being." Residential Patterns of Arab Americans: Race, Ethnicity, and Spatial Assimilation can be purchased in hardback for $62 at the Whitworth Bookstore at (509) 777-3277. 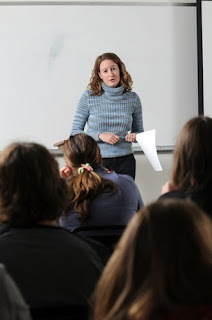 Holsinger, who joined the Whitworth faculty in 2004, earned her Ph.D. and a master's degree at the University of Washington, and her bachelor's degree at Seattle Pacific University. Her areas of specialization include demography and ecology, international migration, race and ethnic studies, and Middle East studies. Holsinger is a member of the Pacific Sociological Association and the American Sociological Association. Jennifer Holsinger, associate professor of sociology, Whitworth University, (509) 777- 4517 or jenniferholsinger@whitworth.edu.